The question is simple, but the answer is complicated. 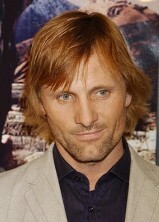 Asked how playing Aragorn has affected him, Viggo Mortensen struggles to reply, trying to put the experience - three films shot at once, released over the course of three years, with several weeks of additional photography squeezed in before each release - in perspective before actually tackling the query itself. 'After four years on a job like this you get to know the character fairly well,' Mortensen says. 'I invest as much of myself as I can when I'm working on it, and I take pride in doing as good a job as I can. That means bringing any influences I can into what's there, beyond what's in the script and beyond what happens on the day on the set. 'I find it interesting, that process of researching,' he continues. The central lessons of The Lord of the Rings play out again in Return. It's the little guys, literally and figuratively, who are among the saga's greatest heroes. Victory and survival must come at a great price. It takes desire and sacrifice and teamwork to ward off defeat. 'Frodo and his Hobbit friends are essentially the ones that get this thing done, with our support,' Mortensen points out. 'Many characters sacrifice themselves. Gandalf gave himself over, he bought them time by fighting the Balrog in Moria. Sam literally carries Frodo on his back in the third movie. Aragorn repeatedly puts himself in harm's way, as do Gimli and Legolas. Going to the Paths of the Dead is something that is vital, but it's also personally a big risk for Aragorn. The sacrifices that the battle against Evil involve are clearly on Mortensen's mind, so it's no surprise that he has strong views about the current situation in real life. Indeed, he was widely criticized for having likened President George W Bush to Sauron and Bush ally John Poindexter to Wormtongue during interviews to publicize The Two Towers. But as with those who complain about changes Peter Jackson's made to Tolkien's original text, the actor simply chalks up any negativity to experience and accepts that there's no pleasing everyone. 'I don't make a practice of going on the computer and looking and seeing what's going on,' he says. 'I know that things are there. Every once in a while somebody will make an attack on something I said, or thought I said. Sometimes I think that has more to do with that person's life and is something about them, and I don't try to get involved in that, and I try not to take things too personally. But people do react to him. Mortensen was a working actor before the trilogy began, with credits including The Texas Chainsaw Massacre 3, the Psycho remake, Crimson Tide, Portrait of a Lady, G.I. Jane and A Walk on the Moon, but The Lord of the Rings has put him on the map. Nowadays the actor - a private and quiet guy - is in the spotlight, and it's been a mixed blessing. He just can't do it. There's simply no way Mortensen can choose a single favourite moment from the Rings films or recall a day that proved the most emotional of all. 'I can't pick one,' he explains politely. 'I've heard people say the third movie is their favourite, but to me it all runs together as one long piece, just like all of the days. Every day had some sort of emotion going on. ONE RING TO RULE US ALL? Rings fans revel in debating the true meaning of the One Ring. Some see it as the source of all Evil. Others view it as the tool of Middle-earth's redemption. Some see it as a symbol of fate that the Ring can, will and must be used to defeat Sauron. Others consider it a symbol of free will in that the Fellowship chooses to rally around Frodo in a joint effort to destroy the Ring. Mortensen has spent plenty of time reading Tolkien, and studying religions and philosophies, and he's formed an educated opinion on the subject.